Cut the cold solid butter into small pieces. Add baking powder, butter and sugar to the flour. Now rub the butter into the flour with the help of your fingertips till it finally looks like breadcrumbs. Add 2-3 tbsp of cold water to it and knead it lightly into a dough of rolling consistency. Now, take lemon sized portion of the dough and roll it out like chapatti but keeping it a little thick. 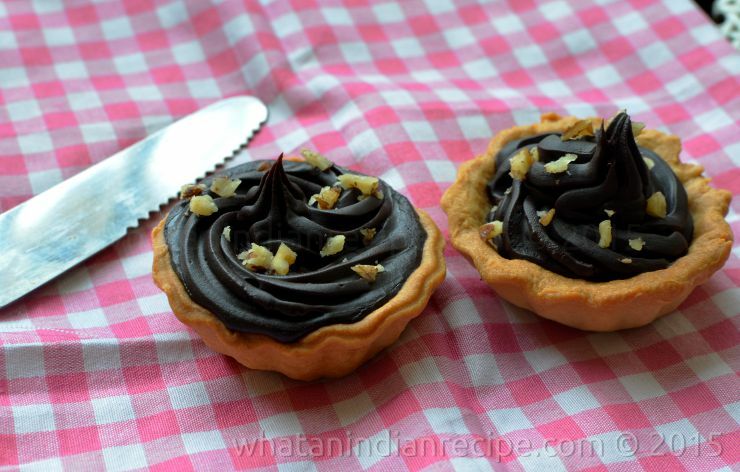 Cut out small circles with a biscuit cutter or a katori which is slightly bigger than the tart mould you have. Take each circle and fit them into the tart mould and prick them with a fork, keep the tart mould in the freezer for around 10 minutes and then bake them in the over at 200°C for 8 minutes till then turn very light golden in colour. Take them out and let it cool. Now, take each tart shell and pipe in the chocolate filling. Garnish with some chopped walnuts.